Gary Morseau’s work to expand his community’s access to healthy food began with his own heart attack at 36. “It was genetics they said, but I know a lot of it was the unhealthy foods,” he says. “I was eating like the frybread and a lot of oily foods. Food that just wasn’t healthy…” Morseau, a member of the Tribal Council of the Pokagon Band of Potawatomi in Southwest Michigan and Chairman of the tribe’s Food Sovereignty Committee, says his own problems mirror larger issues in a Native American community that spreads out over several counties in Michigan around Dowagiac and Northern Indiana. Poor diet, often created by a reliance on low-quality foods supplied by government agencies, has been linked in native populations to high rates of diabetes and obesity. This lead Morseau and others in his community to seek out help from the Intertribal Agriculture Council and their food truck or mobile market. The truck enables trading between native peoples in the Great Lakes area, carrying items like white hominy corn, whitefish, wild rice, and maple syrup from different tribes. The goal is to facilitate economic interdependence between tribes, as well as encourage a better diet and promote gardening initiatives by supplying seeds and cultivation tools. The Pokagon’s use of a mobile market is part of a trend in communities to reduce the distance between people and quality food. Nonprofits are using mobile markets, food subscription boxes and other distribution strategies in communities throughout Michigan. This reflects developments in the private sector like meal-kit boxes such as Blue Apron or food trucks that have become ubiquitous in urban centers. The strategies employed are specific to the communities themselves, but they all pair a desire to increase food access in underserved communities with developing local food businesses and a sense of connectedness between citizens. “Basically, this initiative got started when the water crisis hit,” says Cheryl McHallam, interim executive director for Flint Fresh, a food delivery and mobile market service. Flint Fresh emerged from discussions between nonprofits and businesses in the Flint area that were looking to address the effects of lead contaminated water. Fresh produce can mitigate some of the effects of lead contamination and is considered a partial solution for addressing the crisis. Each week, Flint Fresh sets up mobile markets at a half-dozen to a dozen sites with food sourced from local growers. The organization also delivers meal boxes to residences using payments from SNAP and funding from various grants like those from the Valley Authority on Aging, as well as cash. Each week, Flint Fresh sets up mobile markets at a half-dozen to a dozen sites with food sourced from local growers. Food delivery helps close the gap on the lack of places to buy fresh produce in the city. It’s also a good way to provide much-needed nutritious food to the city’s aging population. Food delivery establishes a point of contact and builds relationships between isolated populations and the broader community, providing a means for regular check-ins with a vulnerable group of people. Finding the right mix of funding over the long term is a challenge for these programs, but so is finding the right mix of services and the best points of contact. 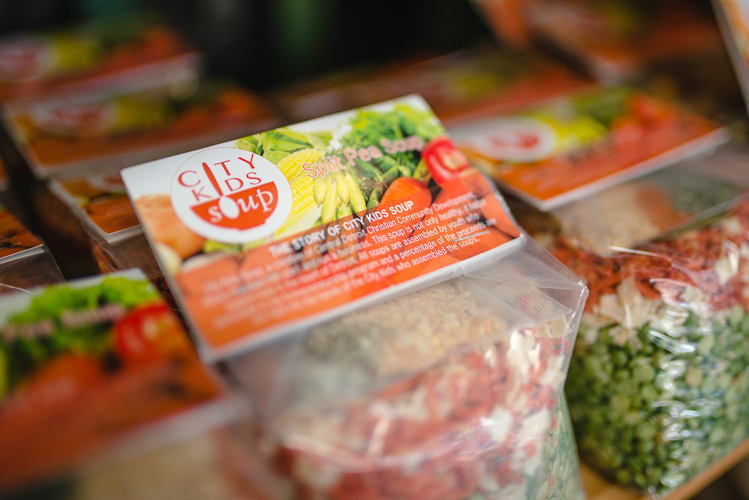 Mobile markets are just one piece of a larger effort to improve eating habits and build community. 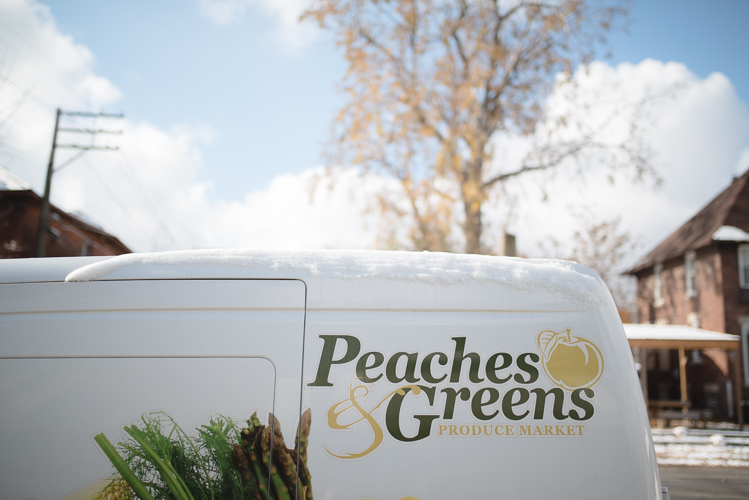 Uclesha Ray, manager of Peaches & Greens, a grocery store and mobile market in Detroit’s North End that operates under Central Detroit Christian Community Development Corporation has done a lot of work to create a diverse market base and find the right places to sell. 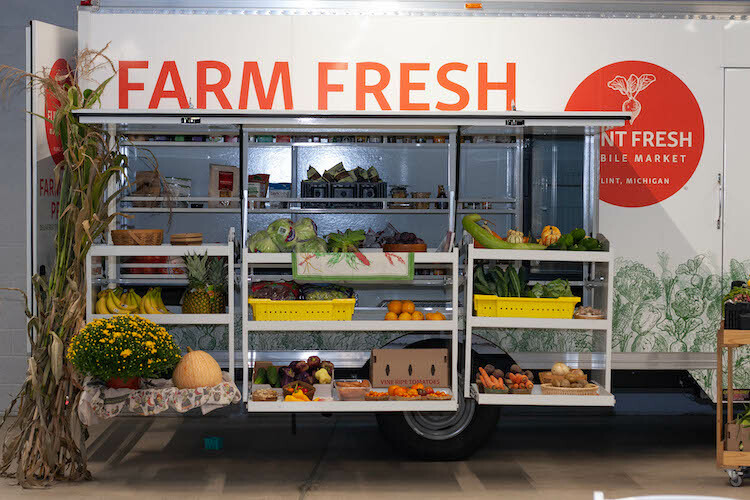 Ray uses the store van to take produce from Eastern Market and the store’s community garden to at least five markets a week with periodic visits to senior centers and other institutions. Ray goes to locations like Beacon Park in downtown Detroit where most customers are office workers who buy fruit and other snack foods with cash. She also goes to nearby Capitol Park, which is frequented by a number of senior citizens who pay with SNAP benefits. By visiting different places, Ray is able to spread the program’s message as well as diversify the client base, decreasing dependency on SNAP or other grant programs. This helps stabilize the bottom line for a nonprofit that has to accommodate year-to-year fluctuations in income from grants and government programs. Flint Fresh does something similar by selling to customers at places like General Motors and Hurley Medical Center, most of whom pay in cash. 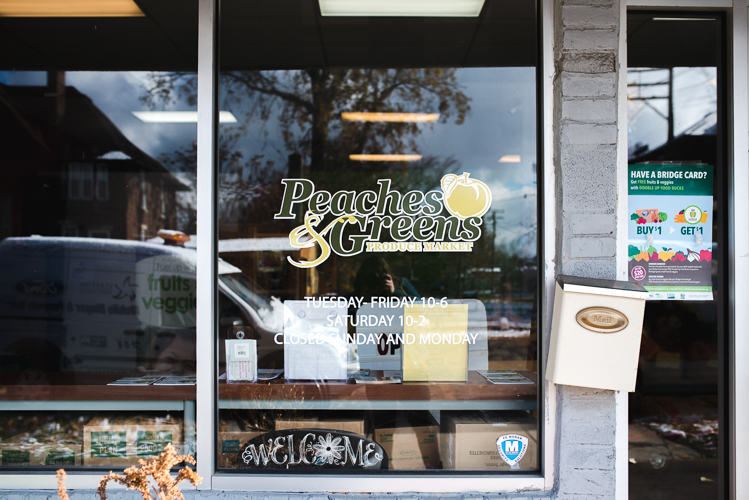 Peaches & Greens works to develop a diverse client base. For all of these organizations, mobile markets are just one piece of a larger effort to improve eating habits and build community. Morseau and the Pokagon Band plan to build a store that sells native foods, providing quality food choices, but also creating a food destination for visitors. Flint Fresh is looking to start a food hub where produce from local farmers can be processed and distributed to wholesale buyers, as well as through their current programs, which could grow the number of people they employ. Peaches & Greens is an initiative of Northend Christian Community Development Corporation. As Pasbjerg sees it, this development is part of reimagining what a place like Flint can be, as the town changes and the region comes to terms with larger trends in the food economy brought on by an interest in eating locally and seasonally, as well as shifts in food availability brought on by climate change. “Things are going to change a lot with the availability of food from other places,” she says, a situation that could make where we get our food and how we get it to our neighbors that much more important. Photos by Steve Koss. Flint Fresh photos courtesy of Flint Fresh.